West Biofuels has conducted research to advance the commercial readiness of a system to convert woody biomass residue into a mixed alcohol product high in renewable fuel ethanol. Woody biomass is a critically-underutilized resource in California and this technology could enable a new market for this material and as well as a new in-state biofuels production sector. In addition, the process was shown to produce a fuel much lower in carbon intensity that current ethanol produced from corn while reducing criteria pollutant emissions and forest fire risk. WestBiofuels utilized synthesis testing with a mixed alcohol synthesis catalyst on three different reactor scales to evaluate the technical and commercial viability of the process. During parameter testing, optimization of temperature, flow, pressure, and gas composition was performed. In a separate long-term test, 1000 hours of on-stream testing evaluated the performance stability of the catalyst. The project team was able to show a high conversion rate for the biomass-based syngas and a product stream high in ethanol and higher alcohols (primarily propanol). Technoeconomic analysis showed that the process reduced the capital cost of a benchmark system by 10%,and therefore reduced the price per gallon of ethanol. In addition, the process yielded a ten times higher quantity of co-products such as propanol which have a potentially higher market value than ethanol. Dual Fluidized Bed (Gasifier and Combustion) to produce high quality syngas. Gas Compressor to compress syngas to 2500psi (172 Bar). Chemical reactor to convert syngas to mixed alcohols with a catalyst. Thermal management system to maintain a reactor temp around 600F (320C). Custom logging and controls to control the entire system and monitor testing. 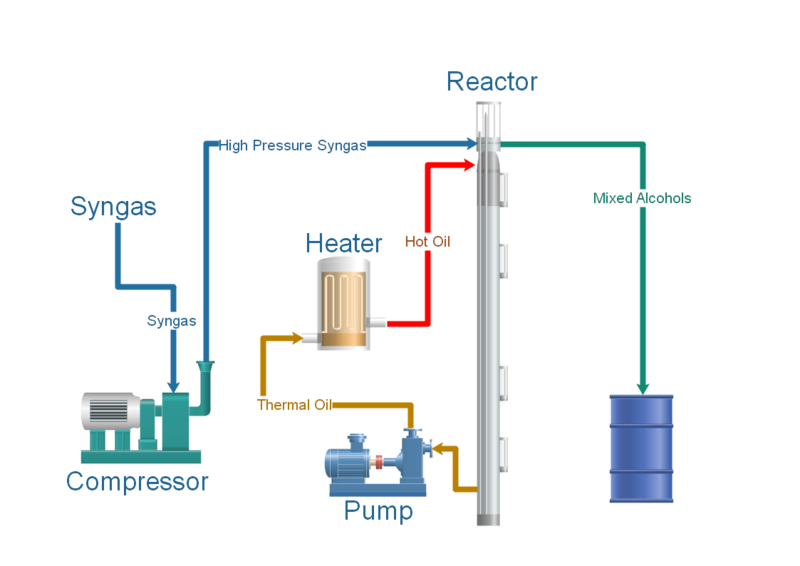 The Mixed alcohol syntheses system converts syngas produced by the fast internally circulating dual fluidized bed gasifier into a mixture of alcohols via a catalytic process. The syngass is compressed and introduced to a patented fixed bed catalytic reactor containing a proprietary catalyst. Reactor temperature is maintained via a liquid thermal management system. The alcohol products are then collected for further processing into fuel, fuel aditives and chemical markets. This technology has demonstrated the ability of producing roughly 60 gallons of liquid fuels per ton of biomass.